Happy New Year to all! As we now watch 2017 fade from view in the rear view mirror, we look forward to 2018… with some big news! 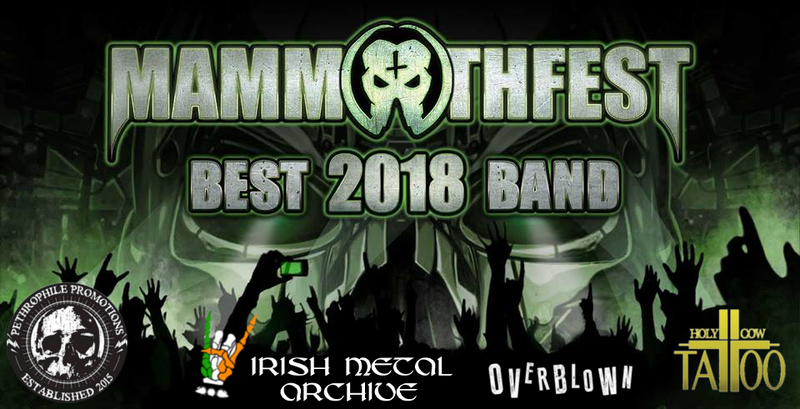 Pethrophile Promotions (Cork) in the cooperation with Mammothfest will be running a competition to find the best Irish metal band, who will then get to play at the Fest in Brighton, UK on the 5th to the 7th October 2018! Across the UK, 10 other promoters will be running similar competitions, so altogether there will be 11 amazing bands sent off to play Mammothfest​ where the best band will be decided after they all play the festival! We at MAMMOTHFEST pride ourselves on presenting THE BEST bands at our festival and the only way to do that is for us to get out there and see for ourselves the incredible talent that can be found across the UK. We therefore have hand selected 11 promoters/venues across the UK (and Ireland) to start looking for the best bands who can all compete (for free) for a chance to win their regional heats and go forward to compete in the national final at MAMMOTHFEST 2018 on SUNDAY 7TH OCTOBER 2018. Mammothfest simply want to not only find the best bands in each area and have them all perform/compete together on the Sunday at Mammothfest 2018 where they will compete in the national final for a chance to be crowned the MAMMOTHFEST BEST BAND 2018. We hope this will give bands a leg up in this tough industry! In order to apply you will need to visit the Pethrophile Promotions website and let them know why you should win, and submit a copy of your EPK or links to your music online. So enter now if you believe you can win. But be quick, the closing date is 13/01/2018! All entries will be based on quality, so it is not a first come first served basis. Spaces are limited to 16 spots however it may expand depending on the quality of the entries! The first Heat will be kicking off on the 2nd March 2018, with the following three Heats running on the 16th of March, 31st of March and 14th of April. The Semi-Finals will be on the 24th of April, and 12th of May, and the Grand Finale will take place on the May 26th. The first four Heats, and Semi_Finals will take place at An Spailpin Fanach on South Main Street, Cork, and the Finals will be held at The Poor Relation, on Parnell Place, Cork. MAY THE BEST BAND WIN!! They are an integral part of the Irish and international tattoo scene and have been very supportive of our project, we would advise you to check them out right away !! DIY music fanatic Jamie Coughlan has always been a massive support for us, both with guidance and exposure , you might even see him on the judges panel! The Irish Metal Archive is a non-profit, DIY operation started in 2010, set up to help promote and preserve the Irish Metal Scene. The aim is to catalog and preserve everything related to Irish rock and metal from it’s earliest roots to present day.